How Many Calories Are in a Cup of Clam Chowder? 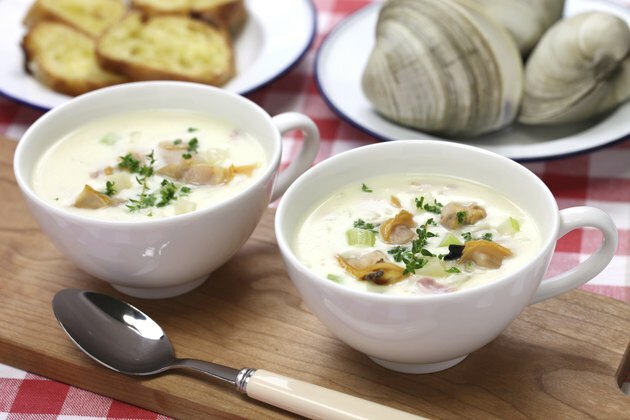 Although clam chowder is not a low-calorie food, it does provide you with some essential nutrients, and you can still include it – in moderation – in a healthy meal plan. But overindulging in clam chowder, especially New England clam chowder, can cause you exceed your daily calorie allotment and gain weight. Because it is a tomato-based soup, Manhattan-style clam chowder is lower in calories than cream-based New England clam chowder. According to the U.S. Department of Agriculture National Nutrient Database for Standard Reference, 1 cup of ready-to-eat New England clam chowder contains 201 calories. To reduce the calorie content of homemade New England clam chowder, try replacing cream with low-fat milk. The USDA also notes that 1 cup of Manhattan clam chowder provides just 134 calories per cup. Choosing soups that are not cream-based -- such as Manhattan clam chowder -- instead of New England clam chowder can significantly reduce your daily calorie consumption. For example, 1 cup of chicken with rice soup contains 127 calories, 1 cup of tomato soup prepared using low-fat milk provides 139 calories, tomato soup prepared with water contains 74 calories and 1 cup of beef with vegetables soup provides 120 calories, according to the USDA. Clam chowder is high in sodium, which contributes to heart disease when consumed in excess. The USDA notes that 1 cup of New England clam chowder and 1 cup of Manhattan-style clam chowder contain 871 milligrams and 1,001 milligrams of sodium, respectively, which is almost half of an adult`s recommended daily sodium allotment. The publication "Dietary Guidelines for Americans, 2010" suggests that adults limit sodium intake to 2,300 milligrams daily -- while older adults, African Americans and those with high blood pressure, kidney disease or diabetes limit sodium to 1,500 milligrams per day. Try reduced-sodium varieties of clam chowder. Eating clam chowder, especially if you choose New England clam chowder, contributes to a significant percentage of your daily calorie needs. "Dietary Guidelines for Americans, 2010" estimates that while many men require 2,000 to 3,000 calories per day, women often need 1,600 to 2,400 calories daily to maintain healthy body weights. Weight-loss calorie needs generally range from 1,200 to 1,600 calories per day, notes the National Heart, Lung and Blood Institute. Therefore, if you're having a difficult time controlling your calorie intake, choose small portions of clam chowder or pick low-calorie soups. How Many Calories Are in 1 oz of Meat & Poultry?